Silent Auction Pro is a multi-user, Internet-based auction software system providing complete donor and auction management solution for charitable fundraising. Work for Silent Auction Pro? Learning about Silent Auction Pro? "Great easy to use product with tons of features and wonderful support"
The program was easy to learn and use. Very intuitive! Our members had a really easy time purchasing tickets for an event and looking at auction items. Use at the event made check-in a breeze and quick. teaching the volunteers to use the software was easy and it was great to have a demo database that couldn't get messed up. It was nice to not have to practice on our database. Once a member purchased a table or ticket there was no way for them to go back in and modify it. There also isn't an app for phones yet which would be nice. There is a way to put a shortcut on your phone which makes it work like an app but no app yet. I would definitely recommend using this product. From their support staff, the the ease of use, to the training, to the use at the event, it is by far the best program out there! Time savings, better data tracking, faster check-in/out. 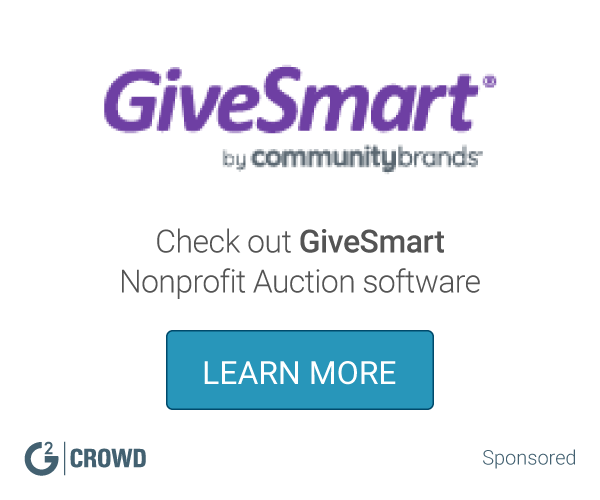 What Nonprofit Auction solution do you use? "Easy to create consistent branding"
This was our school's first attempt at an online auction, and I was impressed by how easy it was to use Silent Auction Pro. As the graphic desiger for the event, it was super easy to upload our event logo to various SAP pages and forms. Being able to maintain a consistent graphic identity with the printed and social media communications we created gave our event a professionalism we haven't had before. I can't think of a thing. I did not use as many functions at the rest of my team members, but the ones I used were easily understood and used. The program allowed us to extend the reach of our school's auction fundraiser to friends and family members of our community who would not be able to attend the event due to distance or other factors. I like the online/mobile bidding piece of the software. It is easy to enter donation and information, the system helps with the increment suggestions and starting bid suggestions as well. There were things we always use to put off until the last because it was so time consuming to decide a starting bid for each auction item. I also really like that the software provides the ability to do both tickets and online bidding. Being able to separate out ticket types, offer a variety of choices (food options/t-shirt sizes, etc.) helps us to accurately capture who supported our event. Another really great thing about Silent Auction Pro is the price. After researching many companies Silent Auction Pro was the most reasonable with all of the different things they offered. Also, I feel like they truly care about the success of our event. Their staff is very knowledgeable and interested in making our event the best that it can be. There is nothing about this software that I dislike. Definitely take a look at their demos. They make their system very accessible when you're looking at different options, so take advantage of that. Also, talk with one of their staff. They are very knowledgeable and have run different events themselves. We have seen an increase in the amount of money we bring in from our Silent Auction. It makes the bidding experience so seamless and easy. We don't have to hassle with bidders about whether someone bid the correct increments, etc. We have realized the benefits of our planning committee being able to socialize and enjoy the event and not worry about the Silent Auction. Other benefits include the event attendees overall enjoyment with online bidding and wanting to be a part of the event. "Very Good Web-based Fundraising Solution!" Once the user account was set up, bidding and checkout were seamless. Was able to process all but three payments and processed these after the fact with an authorized credit card. Users seem to not have a problem with it at all! Customer service is great! They answered the phone and were able to help me immediately every time I called. Because everything was web-based, it was hard to load auction items over the phone because everything was so small. Also, apparently credit cards weren't requires/authorized when entered so we weren't able to check everyone out immediately. Hopefully that's a setting that we can change in the future. Setup was pretty tedious as well but hopefully that was a one-time issue. Check out at the end of our auction was very quick and painless. We didn't have to handle any money and the buyers seemed to like it as well. Never having used an event management software before, I wasn't quite sure what to expect. The team at Silent Auction Pro was absolutely wonderful! Not only was I provided with extensive training on all of the different components of the program but they also made sure to keep me on track by sending me reminders and checklists on what event components I needed to have ready by what date. This is by far the best customer service experience I have ever had. The program is quite intuitive though there was a bit of a learning curve for me. I have only used the program for one event so far but look forward to using it for future events. The only feature I really wish could be added is the ability to import excel spreadsheets. It would make the import of donors and donations much easier and less time-consuming. The program has some great analytical features built into it so that I am now able to see which types of auction items my guests prefer. This information helps tremendously in growing the event in the future since my committee will be able to focus on items we know are highly sought after. Been using the software for 5 years now and find it easier and easier to use. The demo site is awesome if I need to experiment to make sure I understand what needs to be done, and great for my volunteers to play with prior to using it at our event. Support is OUTSTANDING!! Cannot say enough about the support factor. Had minor glitch at our Saturday auction, emailed the issue on Sunday, and Jim and his staff worked on it all day Sunday to get the issue resolved. If I have a question on how to do something, they reply to emails almost immediately. The system keeps track of everything! I like that we can print donor thank you letters with ease. I would HIGHLY recommend Silent Auction Pro. There's so much the system does, it takes some practice to get used to everything it offers, but the more you use it, the slicker it gets!! I wish there was a way to reset donation item numbers back to zero each year, however, the fact that the numbers keep getting bigger (I'm now working in the 4,000's for donation numbers) is a minor annoyance. I checked out 3 other auction software programs and was nervous with going to a system that needed internet connections. It's been absolutely awesome to use, and pleasurable to work with the folks at Silent Auction Pro. I can't say enough good things about the software and the support. The problem of manually doing a fundraising auction was a huge pain. Silent Auction Pro makes it much easier, and quicker! It produces on the spot reports letting people know what they won immediately! I think this was a good system to work with. I am a Special Events Manager, so I use auction software frequently. There is always room for improvement. I think it would be helpful in Silent Auction Pro to be able to pull special reports- such as JUST sponsorships, or just ticket sales. Overall, it was fine to work with. I found it slightly more difficult than other software I have used in the past. However, I can say that their staff is TOP NOTCH and was there any time of day to answer any questions that I had- which I had ALOT working with a new system that I was not used to. With our event, we did not use mobile bidding as the school did not want to. This is a MUST for the next auction our school has. "Silent Auction Pro is an Excellent Tool for Fundraisers"
The program has all of tools a fundraising team could ask for, and more. I especially like the way I am able to get information in various formats to help manage bidders, seating assignments, ticket purchasers and attendees. The program does require a bit of time to get familiar with so that you know where to go to get the info you need. Fortunately, the support is excellent. Wait times are very quick and staff are conscientious in following up with you and even going above and beyond to make sure your event is a success. I cannot rate their support highly enough! Overall, they are a great partner throughout the event planning and execution cycle! Not as intuitive as it possibly could be. Holding our biggest fundraiser for our non-profit. Reducing costs, managing guests and ensuring expenses and revenue are properly tracked and accounted for. "Silent Auction Pro is the software to choose!!" There are many things that I liked about the software. Some of my favorite features are the reporting, easy navigation and setup features that were used for our online ticket sales. We did not use the bid number feature but have learned from this year; we will want to use that feature next year. Silent Auction Pro makes everything so easy. However, the one thing that makes them outstanding is their customer service. Anytime I had a question, they were there and they were there with the answer I needed. There is not a perfect software for anything, everyone knows that. There are a couple of little things I would like to see differently but we will work together to come up with a solution for those items before the next event! Silent Auction Pro is extremely professional, reliable and overall a fantastic software. The customer service is the best, especially when you talk to them several times on the day of your event. I was overly stressed about many things leading up to our event but my software was the one thing I had no worries about. I knew I could make a phone call or send an email and have a response immediately. We used the software for our online ticket sales, tshirt sales and for tracking all of our donated items. Donation entry was easy and the reporting feature was great! We have learned that not using bidder numbers is a mistake, and we plan to implement that into our event next year. "SAP took our school fundraiser into the digital age :)"
The things I liked best about SAP was that it expanded our reach to people that did not attend our event, therefore raising more money for our school. Also, I think it made it possible for parents to socialize at our event more since they didn't have to be running back and forth to check on silent auction items. It made check-out so fast and easy, people loved to be able to do it on their phones, and knowing instantly which items you won was awesome. The only thing that was challenging was that with learning a new system it's a big learning curve, so I think this first year took a lot more time in figuring things out. Next year things will be so much easier, all our contacts are already loaded, past auction info in the system for reference, and we have already learned most of the ins and outs of the system now. With that said the SAP team was really helpful, we all called and emailed questions a lot and they were all so helpful and supportive of our event. We had been asked for a few years if we could do an online auction for people that can't attend our fundraising event, or don't want to and we finally were able to make that happen! We raised more money with the help of the online system. "Silent Auction Pro - Met All Needs at a Great PRice"
Silent Auction Pro offers all the functions we need for our annual event -- ticket sales, silent and live auction management, fund-a-cause management, and even coordination of payment for participation in games like Heads or Tails. The event/customer service representative checks in frequently and is always helpful. The CEO is also accessible and follows up personally, if needed. I can't imagine getting this level of functionality and customer service at a better price. We had to learn how to manage certain functions - sponsor ticket sales, reconciling potential duplicate entries. However, there were videos and instructions that made learning this easy, and our event representative was easily accessible if we wanted someone to talk us through a process. Silent Auction Pro has simplified ticket sales and auction management and allowed us to try mobile bidding, which we loved. Our auction and Fund-A-Cause proceeds increased this year as we transitioned to mobile bidding for the first time. "The best value software with a minimum learning curve for our Rotary CLub"
After an extensive search three years ago, we decided on SAP (Silent Auction Pro). It was the best decision we made. We have used it for three years and could not be more satisfied. It has totally eliminated many of the mundane manual process in running a Golf Fund Raiser for our Rotary Club. They still have a few bugs but they are constantly fixing it. The issues are so minor that we hardly notice it. Given the Price/Benefit, this solution for a small non profit is by far the BEST. Organizing a 100+ person event every year for a small community service Rotary Club is a major undertaking and SAP has helped in our efforts. The best part is being able to bring back any history from the prior years. This is HUGE. "Silent Auction Pro has drastically improved our school auction experience and profit!" The Silent Auction Pro team thinks of everything for you! As an elementary school auction co-chair, with a full-time job and two kiddos . . . putting on a school auction is a huge undertaking, and not my primary area of expertise, obviously! Silent Auction Pro has helped us transition from a paper only auction to a mobile bidding auction over the past several years. Their customer support is stellar. Always available to walk me through any question and figure out even the smallest question or concern. Their staff even searched for any potential problems the week of auction, found one and fixed it for me! They also helped trouble shoot bidder issues that popped up at the last minute. Truly excellent customer service! AND, their pricing is very competitive! There is nothing in particular I dislike about the software. Silent Auction Pro was a huge help for our nonprofit auction. Reasonably priced, with outstanding customer service! Silent Auction Pro helped us transition from a paper based to a mobile bidding auction seamlessly - saving time and increasing profit! Our customers were huge fans of the mobile bidding, and the ability to check themselves out! "GREAT SOFTWARE! ESSENTIAL FOR ANY AUCTION!" The only reason our event was a such a HUGE success for us was Silent Auction Pro. You all provide great assistance and information to run an event. I have been extremely impressed with the friendliness and professionalism of your entire staff. Vantiv was an easy setup for the payment processing. The thing we loved about SAP was the online and mobile bidding. Online and mobile bidding increased our revenue by nearly 200%. The system is so easy to manage, setup, and use... it is just crazy. The customer service is second to none. If you wanna take your event to the next level, SAP is the way to go! We love it and are sticking with SAP from here on out! There is nothing to dislike! As with any software, you must spend some time to get familiar with the system. Great customer service was there at every phone call of every minute before, during, and after the event! Service second to none! GET IT! You won't be disappointed! Use every option they have including the online/mobile bidding! It will take your event to the next level! Streamlining checkout at our event. This was huge! People just checked out and paid as soon as the auction was over via their phones! NO MORE LONG LINES AT CHECKOUT AND NO MORE PAPER! A HUGE SUCCESS! "Great & I hope to be able to use the software again next year for our event!" The customer service rep assigned to my case was FANTASTIC - in fact, she reached out to me more than I had to reach out to her. Whether I had a quick easy question or a BIG confusing question, I also felt more confident after talking to her. The only drawback, and it isn't even really a drawback, is that the software can do SO much that I didn't even take advantage of. I am hoping that after learning the basics this time around, I can dig a little deeper next year and use more of the reports and functions that are available to me. Use the free trial option and really play around to learn all that is available with the software. And take advantage of the customer rep assigned to you - Becca was the best! Safe & secure place to store and update contact information. Easy reports. Easy bid sheets. Streamlined check in and check out process. "Easy to use with a professional look!" The support provided by the team kept me moving forward. The were always quick to respond an get me the info I needed. The software is easy to use and pretty intuitive, once you spend a bit of time becoming familiar with it. Pricing was very fair. I felt a bit on my own initially, like I had to figure it all out by myself, but once I reached out for assistance it was all great. I now realize that all I had to do was ask for help, the the staff was very helpful. Don't hesitate. It's great, easy to use, and will make you look like a pro! We needed to raise fund from outside our normal constituents. Holding an online auction was the ideal way to accomplish this, and with this software, it was easy and looked very professional. "Very professional and easy to work with "
There really is nothing that we disliked. Our first venture into online auction and it was great . We have been doing a Silent Auction for over 10 years and we always wanted to take it up a notch and going online did just that took us to the next level. "500 Guests and 200+ Auction Items and all went Smoothly!" Our first time using Silent Auction Pro at our non-profit gala with 500 guests. It went very smooth for our 1st time. We did have a Silent Auction Pro staff member on site to quickly handle non-standard charges. The Kiosk/Proxy bidding makes it easy for those that do not want to use their mobile devices. Nothing. There are a couple of things I would do different, such as add a new tag in Contacts to differentiate attendees from other contacts but nothing in the software that we disliked. We purchased the software in November and the gala was in February. In that short time we learned the product, setup and configured all our guests, donors, donation and auction items. Learning is easy and the online help and YouTube videos are good. The results are instant. Check-out is a breeze. No long lines. This is terrific software, especially for a smaller nonprofit. What sold the software to us is that when I inquired about it online on a Saturday, I got an immediate phone call from the owner of the company and software developer. This was very typical of all interaction with this company throughout our use of the software - we got immediate responses from support when we had questions, they understand that auctions happen on weekends and support needs to be available then, and when we found a few quirks in the software they were repaired immediately, often by the developer personally. We previously used Greater Giving and BidPal; all three have features that I like and don't like, but overall SilentAuctionPro is by far the best value for the price. The a la carte pricing is a huge benefit for nonprofits like ours that cannot use all features (i.e. online bidding). Overall, from last year to this year (BidPal to SilentAuctionPro), we went from about 100 to 195 attendees, from $25K gross to $45K gross, and from our worst checkout ever to our best. The instruction files, help menus, videos, etc were by the far the best of any nonprofit software we have used. We were invoiced after the auction for the software, which could be of great benefit for a nonprofit just starting out with their first auction. I would love to be able to have a website where people can enter their own donations and have them populate as donation items in the system. There were a few quirks like the system not liking quote marks and ampersands. I would like for there to be a bit more explanation on the page about the security of registering your card as many of my guests weren't comfortable doing so at the time of ticket purchase. It would also be great to have more customization options for the ticket sales page. Because of the way we run our auction, I would very much prefer to be able to assign bidder #s to a household rather than to an individual, but this would have been fine if we had noticed it earlier and planned accordingly. I would also like to be able to customize a bit more on the receipts, include ticket descriptions, etc. I would have set up our fixed price items differently than we were advised to as I don't think it was the best option for our auction and was a bit of a hiccup, but in fairness it was something we didn't get to in advance and did on the fly, so it would have been avoidable with a little planning. Although the reports are generally pretty great, I did have to piece together a few to get to what I needed which could be a pain for someone with less Excel experience. Really minor, but because we can't use online bidding, I print our bidsheets on carbonless paper. Would very much prefer that the half sheet option printed as a 2up because I ended up reformatting them in Adobe to save printing cost. Definitely do your homework on auction software before going with one, especially if you have quirky needs. They all have different little quirks and strengths and weaknesses. Ideally, request a trial usage of the software and make sure it does everything you need. Enter sales, print receipts, etc. We run a gala event at a horse farm, with a silent and live auction, ticket sales, item sales, and donations. We have limited internet and power capabilities and need a software product that makes administration simple and quick. "Silent Auction Pro makes our Silent Auction Stress Free!" I love that our families are able to enjoy the event and not puppy guard the items they are bidding on. The mobile bidding option makes it easy for people to sit at their table with their friends, rather than hanging out by the silent auction. With the ability to set a proxy bid, it is easy for our families to support our organization with their max bid. Finally, we have so many people who are able to bid on our items without physically being at the event. This is probably the best feature in my opinion, but the stress free checkout is great too. The only thing that was a little annoying at first to get used to was that every attendee at the event gets a bidder number. As most spouses only want one number for the event, it is always a little bit of an effort at check in to see which number they want to use, and then link the credit to that one. Make sure you take the phone calls from the Event Coaches as they can help you with so many different questions. They are there to help your event succeed! We are a small private school with limited staff resources. SAP allows me to run the event and save man power and hours worked by offering the simplified check out at the end of the night as long as you collect cell phone, email and credit card information at check in. "Great Program and Awesome Service!" I found this system to be very user friendly. The few times that I had questions or needed assistance, the Silent Auction Pro team was quick to respond and made things much more simple than I was trying to make it. This was our first time doing an online silent auction and I feel that this was PERFECT for us! I was also very pleased with the ability to post pictures and lengthy descriptions with the items we were auctioning off. The payment process for the auction winners was wonderful! They were able to quickly pay and the reports that the system provided to us truly made delivery and follow up easy for us. The only issue that I had was that this system seems to be set up for those who are having "an event" along with the silent auction. Sometimes, that made things a little confusing for me as we were only doing the online auction. A couple of little changes could be made for those who do not have events so that there are options for both types. If you are looking for an Online Silent Auction program for your organization - you cannot do any better than this! We are a small Kiwanis Club which does not have many options when doing fundraising. A lot of other programs tend to be geared towards large clubs and organizations - Silent Auction Pro was not. The benefits are simple - Ease Of Use, Great Customer Service, Awesome Auction Site = Income For Us To Better Serve Our Community. "Silent Auction Pro has streamlined our events!" I love this that software handles everything for our entire event, not just the silent auction. We use it for ticket sales, to print out bid sheets and info sheets for our auction, to keep all the records and reports, for check out, for sending emails and letters to attendees and donors, and for generating tax receipts for donors. When I do come across something I don't like or think could be improved I simply let them know at Silent Auction Pro and they are always willing to improve things based on my feedback. Their customer service is excellent! I have solved the problem of having to use several different programs to run my events. It is also a benefit that all the information on donors and attendees is saved from each event. That makes subsequent events easier. "Using this system took our event to a whole new level." We are a day and boarding school, so using mobile bidding allowed our parents from around the world and around the country to participate in the silent auction even though they could not attend the event. For people who are not tech savvy, there is a learning curve getting yourself set up to participate in mobile bidding. Some of our parents and grandparents became frustrated the first year and missed the social aspect of checking on the bidding sheets. Tracking profit margins on items, who paid the night of the event, who still owes for items they "won" at the auction, exactly where you stand on any given day on ticket sales,, etc are all positive aspects of this program. This is a very user friendly platform, which allows for ease of use and training. There are a ton of how to's in the help section, if you can't find what you need in that section, their customer support team is top notch. We will be using this software for years to come. Getting to different places within the software is a bit time consuming. It would be helpful to have frequently used shortcuts, placed within the software to be able to jump around quicker. Having a one stop shop type of software has greatly simplified our fundraising efforts. this system is easy to use and can be used from processing tickets sales, to running reports and much more. "An Excellent First Time Experiene"
Silent Auction Pro was a fantastic tool for us for our first online silent auction. It had enough flexibility to allow us to manage our unique online only use, it was fairly straightforward, and we didn't have a single bidder complaint about access. Our event went very smoothly! Silent Auction Pro support was terrific, and the software was very good. It was easy to use, flexible, and when we had questions we could either find them on the help page, or the very helpful support team was quick to respond (including late into the night and on weekends). The software wasn't always intuitive, so we ended up calling support a number of times. Often the answer was on the help page and we were either too lazy to find it, or didn't use the right search terms. That said, the support team was very quick to respond to our emails and calls, and very helpful. We were able to run an entirely online silent auction, allowing bidders from across the country to participate. Amazingly, we did not get a single complaint from a bidder about ease of use and all but a couple of the almost 300 bidders were very clear on how it worked. I love the ability of the promoter components. We were able to send out a bulk email to a large number of potential donors. Thank you letters after the event took minutes to print. Before, it took weeks for our volunteers to get the thank you's to donors and guests. So far, I have liked everything. We did not use all of the features Silent Auction Pro offers, but are hoping to in the future. It is worth the cost to our organization to use Silent Auction Pro. Our volunteers are limited and this makes the work much for efficient for those who give of their time to our event each year. Silent Auction Pro's coaches made the transition very easy for us and answered all of our questions. We are reducing postage costs for our event, which is a major savings to our group. As we move forward, we can use Silent Auction Pro to better communicate with our guests and our donors. The friendly and knowledgeable customer service as well as the ease of use of the system. The system is extremely intuitive and easy to use especially during the event! I have tried more than a couple systems and have found Silent Auction Pro to be the best around! The aesthetics of the back end are not real 'attractive'. The system is highly functional and easy to use, but would love to see a redesign of the look of the back end of the system. Utilize the full package offered for your event, especially the online bidding portion! It will greatly increase participation and your bids! We had people bidding after they left on their way home and even from the comfort of their own homes. The software helped us more than double our proceeds from last year! We have streamlined the auction fundraiser we host annually. In the past, we used 3-4 systems to host our event, but SAP offers an all-in-one solution that is AWESOME! The benefits are tickets, auction items, silent auction items are all in one place and easy to navigate to in the system. The public URLs for ticket sales, auctions items, auction item viewing, and even a live event ticker for the event are some of the great functions! "Simplified Management of the Auction at our Non-Profit Event"
From an administrative standpoint, the software helps you manage all aspects of the auction at your event. Not being able to bid without creating an account first. Ask lots of questions, be sure to include people in the review process that are very familiar with your event's registration, check-out and auction processes from prior years. Get a demo so you can see the functionality first-hand; a demo will help you assess the functionality's fit for your software needs. We are a small non-profit with an equally small (but mighty) volunteer committee. This software allowed us to multiply ourselves before, during and after the event. It saved us countless man hours. Also, our attendees gave us positive feedback about their experience at our event, especially their ability to bid online. I can go back each year and have all my contacts and notes to request again. It makes the process much faster. I eliminate those that waste my time by not responding to requests and focus on those who are generous and always give. It has lots of reports which I found very helpful. Their price to use was reasonable. There should be automatic reminders like charging the attendees 3% to use their credit card. I thought that was on from last year but it was not. It cost of almost $1,000 not having that activated. A couple of glitches were there. Most were corrected, only 1-2 there could not be fixed. "Silent Auction Pro Simplified Our Auction and Boosted Proceeds"
Silent Auction Pro is the best value we could find for online/mobile auction support. The interface is extremely easy to use, and the support is absolutely amazing. 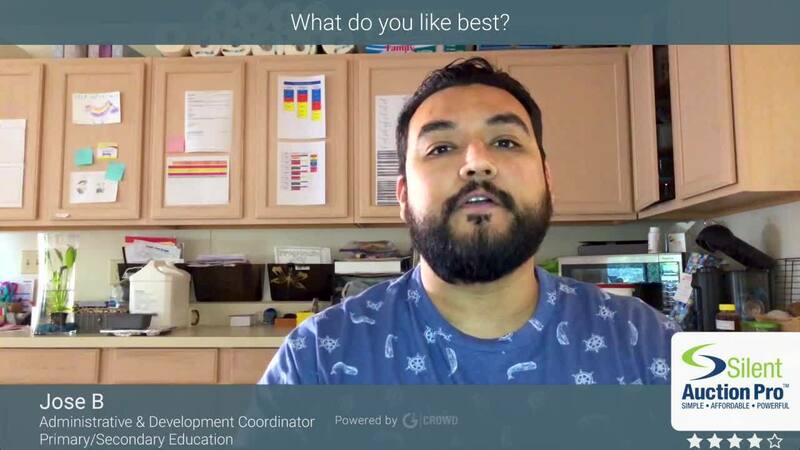 Consider the types of activities you want to support and determine which modules you will need to support it. I wish I had done a better job of this up front, as it saves you time in the long run because there are extra fields that become available when you enable new modules, and it's easier to fill these in as you are setting up. We used Silent Auction Pro for our elementary school fundraiser. The fundraiser has been an annual tradition for many years, but this is the first year we introduced mobile and online bidding and auction administration through Silent Auction Pro. We have a decent sized auction, with approximately 200 items and roughly 250 bidders. Managing this level of auction with a manual process was difficult and time consuming, and once display sheets and labels were printed, it was really difficult to make additional changes. Silent Auction Pro allowed us to streamline the administration process and offer a much better experience to bidders at the auction. We were able to provide an auction preview and open bidding before our event. Preparing for checkout under the manual system was extremely stressful and challenging. With Silent Auction Pro, we were able to immediately begin checkout once the auction closed. We were also able to process cards and collect payment for people that didn't come to collect their items. The entire process was extremely smooth and we had many compliments on the experience. We also were able to increase the return on our auction items thanks to mobile bidding and alerts. "Best Bang For Your Buck "
My organization, the Humane Society of Noble County, Inc. in Kendallville, Indiana, recently used this software at our annual Raise the WOOF gala for homeless pets. I recommend this company to anyone looking for an affordable, easy to use system. It was user-friendly for both our attendees and our check-in/check-out staff. The training and support received before the event was excellent, and (the INCLUDED) technical support staff went above and beyond the night of the event when we had a few users that had trouble with the system (which turned out to be simple password errors and nothing to do with the SAP software). We used a different software company in 2016 - it was ridiculously expensive, complicated to use and technical support was NOT included, but could be purchased for another astronomical amount. SAP had REAL people call us to touch base, they kept in contact with emails, and everything we wanted was included in this system. I will be recommending Silent Auction Pro to our next fundraising committee! Absolutely nothing! SAP was easy to use, readily available, had no hidden fees, provided excellent customer and technical support. No complaints here! SAP does everything it says it does with no inflated prices, PLUS you have 3 different packages to purchase. The technical support and training we received was wonderful! Someone was there for us every time we asked a question. I am the executive director of a non profit that relies in donations to operate. I am constantly looking for ways to save money. "SilentAuctionPro made our first event a success!" Managing a majority of our transactions online through credit cards maximized the amount we were able to bring in by increasing bidding and making our "collections" process a breeze! No chasing down winners and having a one-stop shop for all ticket holders, their contact information, donations, bundles, etc. made everything quick and easy to manage. The support team was also great to work with, very responsive at all points in the process and everyone had great recommendations to make our first event smooth and easy to use! There's not much. I did reformat some of our description sheets due to repeats within the bundles where multiple gift cards were grouped, but it was still very easy to use! 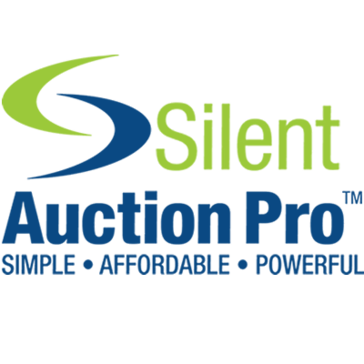 I would highly recommend SilentAuctionPro to anyone hosting a silent and/or live auction. Between the great customer service, the user friendliness and the advantages our event realized through this product over a manual system, it was definitely worth the investment! And the price point made it realistic for a small, first time user group like ours to take on with confidence. We utilized SilentAuctionPro to manage our school's first silent/live auction gala fundraiser. With the help of SilentAuctionPro we were able to exceed our expectations and meet our goal of paying for our school's first playground! "Excellent for our preschool auction"
We love the support that is provided free of charge. It really helps when you aren't great with computers to know that there's help a phone call or email away. And, we were surprised at how quickly we learned the system, too. I can't think of anything I dislike about the software, only things to do differently at our next event to better use silent auction pro. One would be to sell tickets through silent auction pro so that people both purchase their tickets and also register to bid all at once. We thought selling tickets through the site we used before would be easier, but doing everything in one spot will be much easier. Having the parent job at our preschool of keeping track of donations, printing out bid sheets and adding up winning bids by person used to be the worst job at our school. Now, it is the easiest job because of Silent Auction Pro. One of the biggest benefits is the check in and check out time--we no longer have to make people wait to check in or really wait for check out. We used to have people ask us every five minutes what their total was--it was really stressful to answer those questions while also having to concentrate on adding up each person's winnings--silent auction pro does all of that for you. We also really like how it keeps volunteers organized, each having a set of people to contact so that different people don't ask the same company for donations twice. "Great Tool, Great Price, Great Customer Service"
It was great switching to this cloud-based tool so our whole team could use it. Our event guests raved about the fast checkout lines since we used the integrated credit card swiping feature. The customer support was fabulous. The help pages are very thorough and all of my questions and concerns were addressed very quickly - often within and hour. We raised more money at our event this year and any of our past 11 events, so it was a great investment! Some of the exports, reports, and templates are not as customizable as I would like, but certainly very usable. We switched to Silent Auction Pro because we wanted a networked tool with Online Auction capability and integrated credit card features. Everything ran very smoothly. Out guests were impressed with the look of the online auction and the ease (and short lines) of check-out. "Silent Auction Pro helped us nail our event"
Using their online ticketing meant virtually no one had to check in, and check-out was a breeze. Even the usual unsolved mysteries were easier to wrap up with the registered credit card thing. Winning entry also super easy. LOVED being able to ping winners with a text message. It was pretty seamless. The service was amazing too. Support responded to questions really fast, and the milestone reminder e-mails were very helpful. I don't have much to dislike about the software. I ended up making my own bid sheets with mail merge, but I'm super picky, and we only had 60 items, so manually doing the bid increments was not a big deal. For the price point, I think it's the best there is. It does everything you need it to. We used Silent Auction Pro for a School Gala Auction, which raised money for our arts program. "Excellent Auction Software for Our Nonprofit"
Silent Auction Pro is a very user friendly program. Like any program there is a learning curve, but they have the "demo" account making learning a risk free experience. I do wish that not all user accounts would require an email address. I could have used "dummy" accounts for check in/out personnel. We had an excellent event with the Silent Auction Pro software. It made running the event so much smoother than I had expected. This was my first year at coordinator, but even my mentor (the past coordinator) said the software was much better than the past software. Silent Auction Pro is a fantastic solution to facilitate our online and live auctions. We've been customers for six years - the scope of functionality, pricing and pre- and post-auction support is amazing.The ability to run reports that reach back to our original auction is especially useful for helping us reach out annually to our regular donors to make it easier to collect (and track) donations. Because of the scope of functions, the interface is a bit complicated and somewhat dated. But the online support (including YouTube videos) goes a long way to walk you through it (as does the live customer support). Each year the board researches software solutions for our auctions (we're a very small school and so have to carefully consider costs) and each year we stay with Silent Auction Pro. In addition to the functionality, the cost-per-purchase charged by the processing company is the lowest we've found. Facilitating our live and online auctions. Because we're able to track years of auctions we're able to build on the prior year's donations - last year was our biggest success, bringing in $25,000 to support the school, which we felt was amazing considering our school is roughly 100 students. "Easy to use and provided quick information and billing at end of our auction"
The support provided by the software company. No matter what or when my question occurred I got a thorough and helpful response. Some parts were not quite as intuitive as we might have liked. (Such as when donors agreed to repeat a gift during the auction..) Although,when it was explained, it was really quite easy. Practice with the trial program, watch the videos (they are especially helpful), don't be afraid to ask questions, there staff is very helpful. It has has made the organization of the auction much easier. Tracking donations, then at the time of the auction the entry of winning bids, quick production of billings statements and efficient payment via pre-approved credit cards. "Silent Auction Pro took this event to a new level"
Really appreciated the modular options and the simplicity with how they describe the benefits of each module. Interface was nice, simple and mostly intuitive. Wasn't afraid to "click around" and get to know the system. There were very few hiccups for us. There were just a couple of workflow pieces that weren't fully explained on their help support but the team replied so quickly to my email queries that it never slowed us down! Such a reasonable price for super customer service and ease of use. They truly "rooted" for us in the days leading up to our event and stayed in contact throughout. I emailed many questions in the weeks leading up to our auction and they never wavered in their timely responses. We have a silent auction as part of a large public two-day art festival. Using mobile bidding made perfect sense since guests only walked through the silent auction area as they entered the festival. Going mobile allowed them to make additional bids without the need to return to check the bid sheet. Not all guests embraced going mobile, but the percentage of multiple bids per item skyrocketed. "Great Experience with Silent Auction Pro"
We used Silent Auction Pro for the 2nd year in a row for our event. Our auction was 100% online so that families who attended the event could participate as well as many others. We received very helpful support in using the system. We were able to easily send messages, open and close bidding and showcase auction items online. Overall, I'm very pleased with the system. My only criticism is that auction item photos really can't be seen in the mobile app. The appearance is much better on a PC. When comparing price and service, I would recommend this product over other similar ones on the market. The cost of the program compared to others used for an online silent auction is great. "Silent Auction Pro helped us raise more this year than ever!" I like the ease of the bidding, once you are bidding, you are notified when you are outbid, you can also do a "maximum" and the system will bid for you until that maximum is met, then you are notified via text or email. I wish it had an app... The mobile site works ok, but having to go to your browser and login can be cumbersome at times, I feel if there was an app, that would be best and most efficient, easiest to access quickly. Set up automatic texts and test them out before the event. Our system had a glitch that could not really be explained to me. This was a bit frustrating when I set them all up ahead of time and was depending on them. We have raised money for technology enhancements in our Preschool-Grade 12 school as well as professional development for our faculty/staff so those benefits are far reaching. "Responsive & Smart Event Mgmt Software"
Reports are easy and accurate, registration & silent auction check out are a breeze. Support staff is knowledgeable and available. I wish there were an annual membership, easier data share to Raiser's Edge, and either an app or a way to text bidders a link with their info and card on file without having to have them create/remember login info and re-enter CC info. However, SAP team is great with feedback and constantly making improvements. Consider the potential savings using the entire event management software and ticket sales through the product as CC merchant fees are incredibly competitive. Increase in # of bids/people bidder on auction items. Ability to recall and store event trends and data which is incredibly valuable. "My go-to online silent auction platform"
I like that once you're fully trained in Silent Auction Pro the sky is the limit. I wish it worked better for checkout and online bidding. I recently used BidPal at a friends event and though it wasn't perfect, they have definitely advanced with their seamless check-in,check-out, and online bidding options. Silent Auction Pro is an all-in one package. I like that guests can purchase their tickets directly on the website and also preview the silent auction items beforehand. "Silent Auction Pro allowed us to manage over 400 auction items at our annual event." Silent Auction Pro allows us to manage a high volume of donators, donations, auction items, bidders, etc. Customer support is great, they are always available to answer my questions timely. Loved the phone call the day before the event to share the 800 number. Love that we can email receipts to winners. Love that we can notify winners via email or text once a table is processed. Like that you can have multiple users at same time, especially at event day, doing data input, checking in bidders, checking out winners. I have not reviewed any other auction software, so have nothing to compare. SAPro was easy to learn and we are making it work. My suggestions are only to make enhancements on a system that is already working. We used to do this all in excel, that we before my time, I cannot image trying to do this without an auction software. It has it's quirks, but we could not do this without it. "Great Product - Great Support!" The price structure allows you to buy the components that you need and not pay for parts that you will not use. This makes this product affordable for even smaller non-profits. I love the fact that they capture your data and keep it for up to a year. This means that when you run your next event you don't have to start from scratch. You have a list of sponsors, donors, and attendees. It is easy to contact them via email and get your next event kicked-off. In addition to all the great features, the support team is fantastic. Overall, the application is easy to learn. Some of the screens are a bit busy. What do I mean by that? Some screens have a lot of information and fields on them and it sometimes makes it difficult to find what you are looking for. This really isn't a big problem. Once you learn how the program works it all makes sense. I help organize several charitable events a year. Some are quite large. The online ticket and sponsorship component really help streamline ticket sales. The Silent Auction functionality helps organize your donations and auction items. Being able to print bid sheets and bidder numbers or paddles helps save time. The express check-out functions helps improve check-times. Silent Auction Pro has been a great tool for our school fundraising. We're really not tech types so it's ease of use, and especially the detailed help menu with videos was outstanding. I also must commend their customer service - email and phone - for absolutely being there for us. Jim even responded to me on a holiday weekend, AND made a program guide fix that I asked for within a few hours. Unbelievable service. The printed program guide was a bit clunky...no pictures, too much description...but it was easy to fix after uploading to Word. Not much else! Fundraising for school via a silent and live auction. Made $32K in one night using Silent Auction Pro to organize, marketing, track, and collect money on the auction. I was able to get full reports and all the information I needed about our ticket purchasers and on our event auction from SAP. The front end interface, what our ticket purchasers see, is not as visually appealing as I would like. But this is a minor criticism. I was very pleased with this software and will use it again for our next event. I also feel confident that I can easily teach it to others in our organization. I highly recommend Silent Auction Pro for any non-profit who needs hand holding with set up, and who is watching their pennies, but needs a full featured software. We needed full featured auction and ticketing software for our fundraising event, but most of the software out there was very pricey. Some wanted way too high a percentage of funds raised. Some software was less expensive but did not have all the features we needed. Silent Auction Pro was easy to use, priced right, and full featured. "Silent Auction Pro Is The BEST"
Silent Auction Pro's platform is a must for any small to medium non-profit that is holding a fundraiser. They software is easy to use, allows us to track donations, registrations, etc. and made our entire process simple. Their support team was amazing and helped us with all of our questions, even during late night planning sessions - someone is always available to assist. It is hard to find a dislike, but it would be nice to see a few enhancements for check in that I know they are already working on. It would be nice to physically check someone in even if they preregistered so we can keep track of who is there. We used Silent Auction Pro to assist with our Foundation's annual fundraiser. "Solid software support for auctions of any size"
Silent Auction Pro was very helpful in getting and staying organized for our auction. It is a fairly complex bit of software, so the first-time user may be a little daunted by all the options, but the support staff is always (And I do mean pretty much Always) available to explain things, and to help you figure out any issues. They can log in and look at your event with you, and give you real feedback, rather than just general suggestions, which is a huge help. The video instructional resources are also much more helpful that a printed set of instructions and are available on YouTube. Selling tickets online is very helpful, and the partnership that SAP has with Vantiv is a great feature. The folks at Vantiv are also very easy to work with and setting up the merchant account to accept credit cards was very smooth. The SilentAuction Pro software was very helpful in helping us organize the auction and get the results easily and in a timely manner. It also allowed us to analyze the categories of items that did best with our audience. We did have an issue that caused us some delay and confusion. We had some Celebrity Dinners that we knew would generate a lot of interest and would have multiple winners. We didn't want to use the set price option that is offered for multiple winners because we wanted the competition. We ended up with some delay at checkout because we weren't prepared for how to keep track of the multiple winners in that situation. However, I think that closer consultation with SAP's support staff in advance could have helped us avoid most of the delay (and all of the confusion). We also think that there should be a non-profit rate because the fees charged by the software in addition to the fees charged by Vantiv add up and take away from the mission of our organization. You get what you pay for. We bought just the Core and Auction Day, and that was fine for our medium-sized auction (around 100 items and 150 attendees). A bigger event could definitely have benefited from the features of the Auction Promoter, but we were able to sell tickets online and print all the materials that were needed with the package we got. If we had more donors and items, we would have definitely liked to have the letter writing function. I have used this software with 2 different non-profits, and knowing what you need on the back end (acknowledgements, bid sheets, different types of bidding for items like multiple winners for top bidders) will hep you enter your donations and create your auction item better for easier check out and tracking. We raised funds to meet our operating budget. The programs we support are mostly social justice activities as well as children and youth and an adult choir. This event was paired with a free event, a talent show, which drew in additional members from outside our congregation. The tickets we sold were for attending the silent auction and reception. We exceeded our fundraising goal by 50% with this event! We have gained a reputation for putting on a good party and auction! * We monitor all Silent Auction Pro reviews to prevent fraudulent reviews and keep review quality high. We do not post reviews by company employees or direct competitors. Validated reviews require the user to submit a screenshot of the product containing their user ID, in order to verify a user is an actual user of the product. Hi there! Are you looking to implement a solution like Silent Auction Pro?